Marni loves her bed and her philosophy is you can never have too many pillows. Currently on her bed she has 11 pillows - only 4 of them are allowed to be slept on but she just loves how inviting and comfy pillows make a bed look. So this "At home" layout is dedicated to Marni's bed. Marni used some Michael Miller fabric paper including this month FK onsert to frame her photo and create the background for her layout. Marni also used a new junkitz flower on one corner of her photo to create some texture and add interest. She used Basic Grey rub-ons to frame her photo and to extend the rub ons in the left hand corner of her layout. 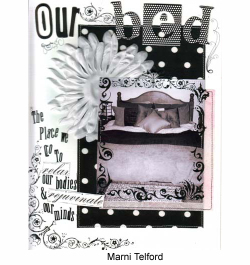 To finish this layout off Marni used Li'l Davis letter stickers with computer printed words to journal about her bed. Tamar has chosen this weeks theme to be all the girly pink she has around the house. She realised the other day when she was searching for items to photograph that so much of it was pink. Tamar couldn't resist doing this layout - she has only just got the pink phone and wallet and they matched the theme of the layout perfectly. 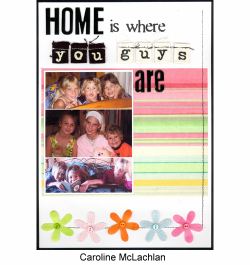 By layering the Michael Miller Memories fabric you can achive a lovely background quite different from patterned paper. Tamar placed a piece of Dumb Dot Candy fabric paper behind the fairy frost fabric paper to get a soft pink shine though effect. Tamar then layered tweed ribbon and tape and sewed them together using a zig zag stitch. 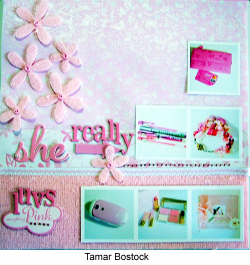 The Heidi Swapp tag "everything pink" was the final puzzle piece when it came to inspiration for this layout. 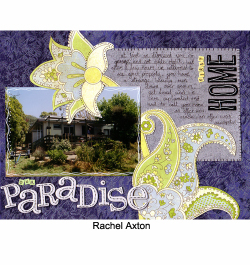 Rach wanted to capture the first home that her and Mark bought together and the story behind getting this home in the layout. Again Rach has used the Micheal Miller fabric in a similar way to the Bath layout (as a basic for the layout) from week 1 but this time Rach just used the stiffened fabric and not the tweed fabric. This fabric is so bright, vibrant and sparkles, it gives the layout pop even though the photo is cluttered because of their overgrown garden. The BasicGrey flower cut from the Lily Kate range wraps around the photo, lighting up the page a little and brings the focus back to the photo. 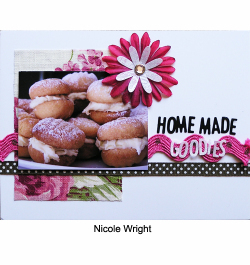 Nic has chosen to theme this weeks layout on the yummy homemade goodies that are often in her house. Georgina loves to cook, as does Nic, so there is always something yummy baking! For this layout Nic has used the Quickutz Machine and the Studio mini font to cut her title out of the Michael Miller Memories fabric - she used jet black and the pink fabric included as the onsert with this months For Keeps Magazine. The Quickutz cuts through the fabric paper with ease. Nic has also cut flowers using the Quickutz and Michael Miller fabric and created the centre of the Heidi Swapp Floral, joining them together with an SEI rhinestone brad. For the background Nic has used some Junkitz Fabric from the mum collectionz. Several years ago Mel wanted something special to put in their garden that would last forever and through the different elements of nature, so she created a large mosaic tile that has pride place in the garden. Mel came across this photo a couple of months ago and knew that she needed to scrapbook it so that the story behind the tile was told. Everyday Moments "at home" theme was the perfect excuse to do this page. 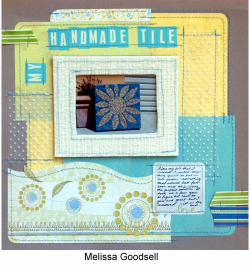 Mel has covered a bookboard frame with the Michael Miller Memories fabric and stitched everything into place using a mixture of BasicGrey paper to create this layered look that finishes the page off. For Caz home would not be classified as home if she didn't have her family around - whether they lived in a caravan or a castle, it just wouldn't be the same with out them. Caz has used the Michael Miller Memories Colorband Pink fabric paper, some Michael Miller krystal petals and tweed petals. The title was created using Heidi Swapp Centre of Attention chipboard letters and the Carolees Creation Love Worn natural love letters and black love letters. Machine stitching has been used again to keep in theme with the rest of Caz's Everyday Moments layouts.